The Chrysler, Jeep, Ram Truck and Fiat brands each posted year-over-year sales gains in September compared with September 2013. Jeep and Ram Truck sales last month led Chrysler Group LLC to its 54th consecutive month of year-over-year sales gains. The Auburn Hills automaker on Wednesday reported it sold 169,890 cars and trucks in September, an 18.8 percent increase from 143,017 vehicles a year ago and its best September since 2005. 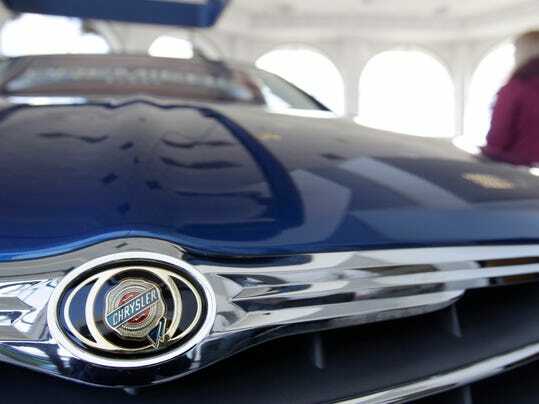 “Chrysler Group sales continue to demonstrate strength as we recorded our seventh month of double-digit growth this year,” said Reid Bigland, Chrysler head of U.S. sales, in a statement. The Chrysler, Jeep, Ram and Fiat brands each posted year-over-year sales gains in September compared with September 2013. The Jeep brand’s 47.4 percent increase was the largest sales gain of any Chrysler brand, followed by Ram Truck up 34.8 percent, Chrysler up 14 percent and Fiat up 6.4 percent. Dodge, down 9.4 percent, was the only Chrysler brand to not increase sales from September 2013. According to Kelley Blue Book, the Ram and Jeep brands have pushed Chrysler’s market share up by a full point this year, to its highest point since 2007. The automaker sold nearly 1.6 million vehicles through September, up 14.7 percent from the same time period a year ago. Chrysler is expected to be one of the top performers in the industry for September, according to analysts. Ford Motor Co. said Wednesday September sales were down 2.7 percent from the same month a year ago. The Dearborn automaker sold 180,175 vehicles last month. Despite the overall decline, Ford’s Fusion mid-size car posted its best September ever, up 8.6 percent compared to September of 2013. The company’s Lincoln Motor Co. luxury brand posted its best sales month since 2010, thanks to the recent introduction of the new MKC crossover. Lincoln sales were up 12.5 percent compared to the same month a year ago. Other automakers, including General Motors Co., are scheduled to release their sales results later Wednesday. Analysts predict September auto sales to rise as high as 10 percent compared to a year ago to more than 1.2 million vehicles sold, helping fuel expected sales of 16.4-16.6 million vehicles in 2014.